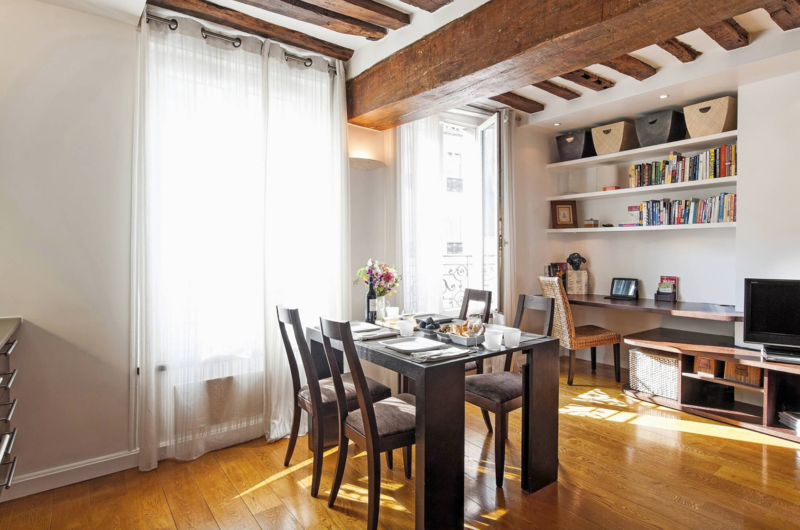 This charming, one-bedroom long term Paris apartment rental is situated in the heart of St-Germain-des-Prés on the Left Bank of the Seine, one of Paris’ most central and sought-after neighborhoods, home of famous intellectuals and chic boutiques. 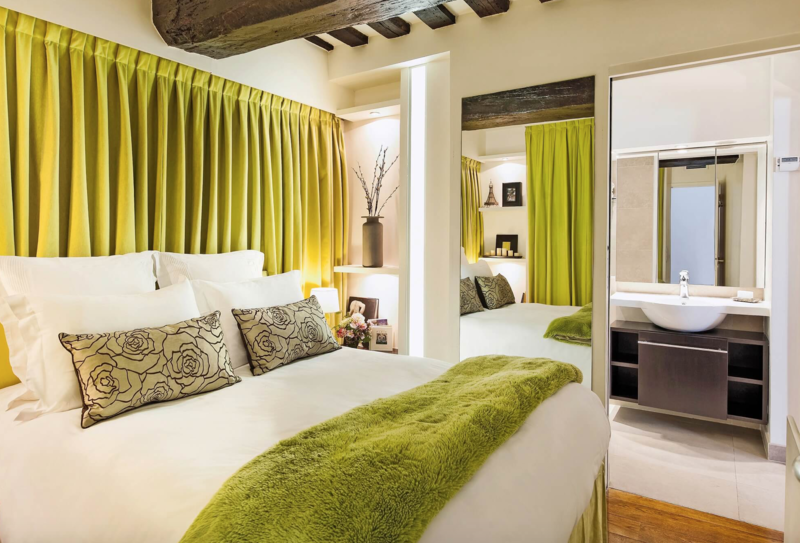 The St-Germain Market property is a gem of a Parisian pied-à-terre combining the best of French style with the comfort and convenience of quality, modern amenities. The property is situated on the third floor of a 17th-century building, you are welcomed by the open living space, which includes a leather sofa that converts to a comfortable double bed and spacious dining table. The modern furnishings create a striking contrast to the exposed wood beams that date back to the 1600s. An open kitchen, fitted with sophisticated dark wood cabinets and a stone countertop, is fully equipped and will meet all your culinary needs. Double-paned windows, electric heat, and central air conditioning keep the apartment comfortable all year round. The bedroom looks out onto the interior courtyard. Luxurious four-hundred thread count cotton linens and European down duvets and pillows provide comfort at its best. 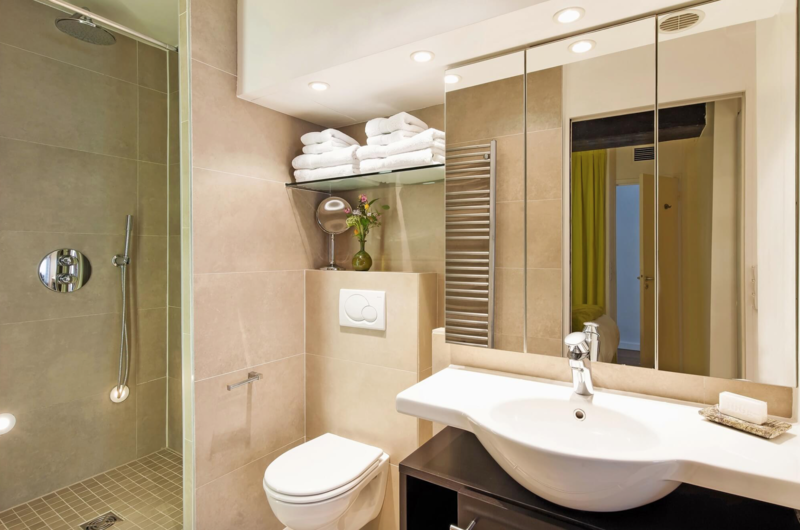 The full bathroom, connected to both the bedroom and the main living area, has contemporary fixtures including a large stone walk-in shower with a ceramic seat and rainshower. 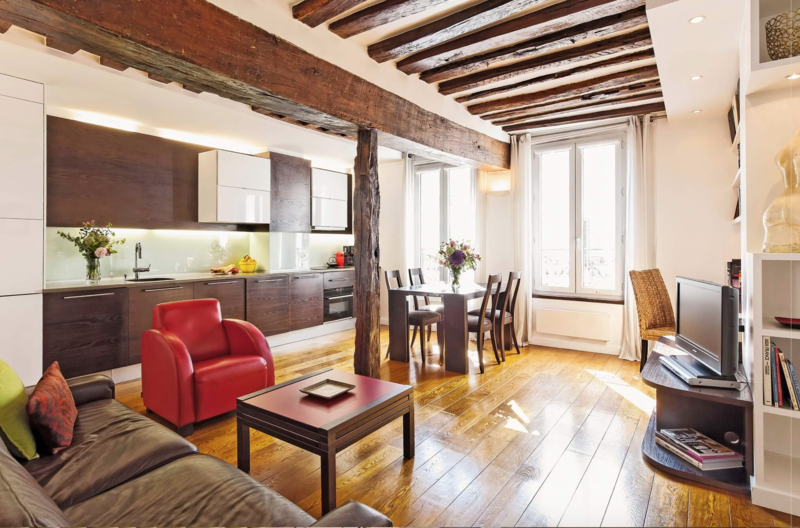 The St-Germain Market property is situated in one of the best locations from which to explore the city. 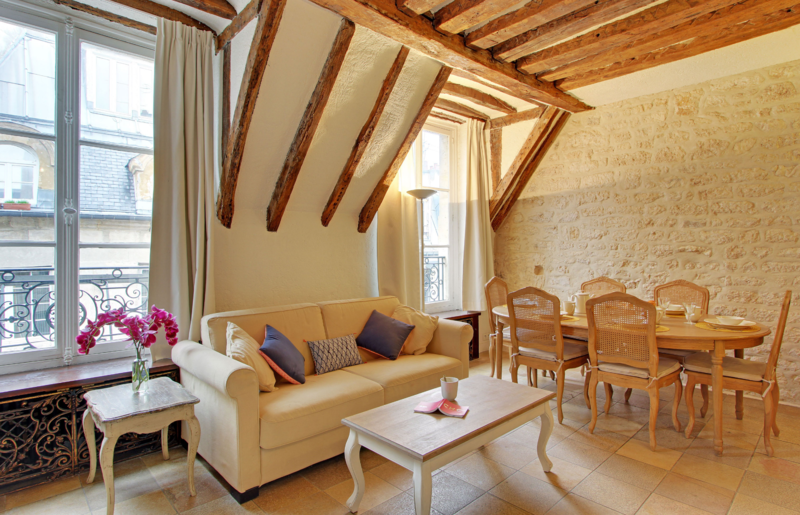 You are within walking distance of countless museums and cultural landmarks: Musée d’Orsay, Sorbonne, Musée de Cluny, Jardin du Luxembourg, Latin Quarter. 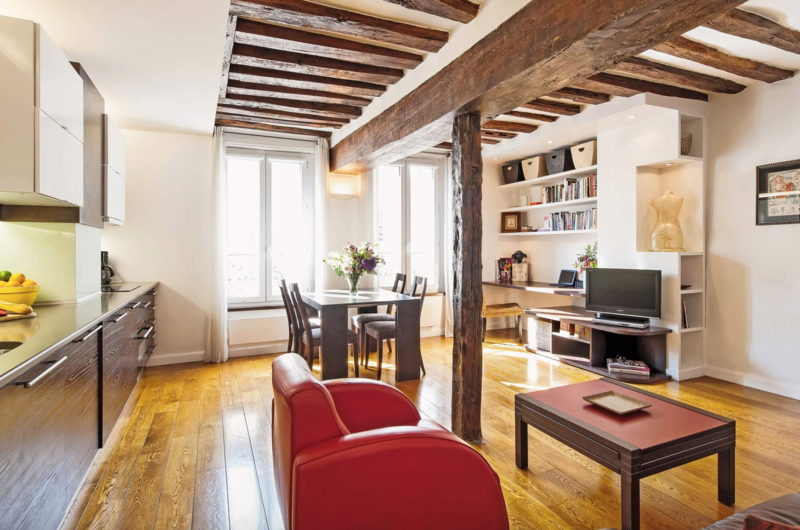 To the north of the property you will find the romantic Seine river and only a three-minute walk to the south is Boulevard St-Germain where you can enjoy the bustle of luxury shopping and famous cafés. 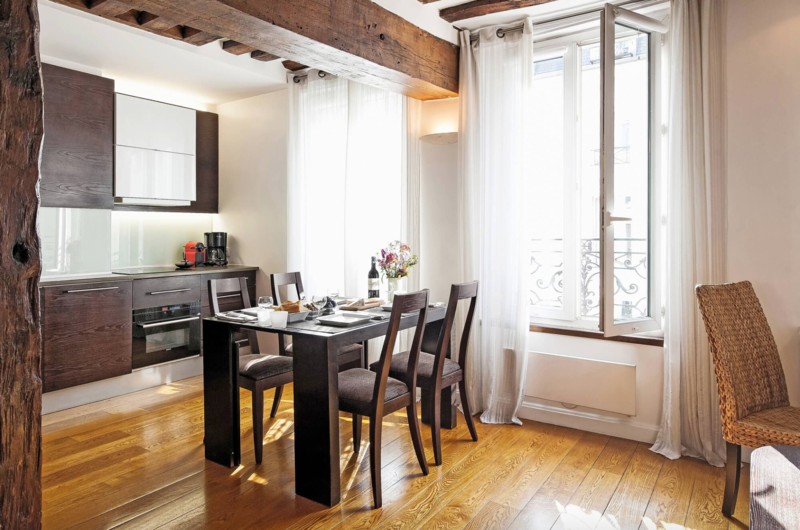 When you start your day at the St-Germain Market property, Paris is truly at your fingertips.